The 2014 Heartland Nationals at Atoka Motorsports Park in Atoka, OK had a National Event-type feel to it with racers coming from as far away as Arizona and Michigan to battle it out in Southeastern Oklahoma. This was the first trip for the Pro Truck Nationals (PTN) group to Atoka as well as the first race for the PTN/Pro Sand Drags Association (PSDA) alliance. These groups brought some big money and unique classes to spice up the Oklahoma show and add to the already great local program at AMP. Here’s a rundown of the action at the 16th Annual Heartland Nationals. The 2014 Nitro Nationals at Motiva Motor Speedway’s The Dirt 300 is just around the corner happening the weekend of June 19-21. This year’s event will be contested mostly under the lights giving everyone more comfortable cooler racing conditions. Test and Tune as well as first round Qualifying will take place on Thursday night with Qualifying continuing on Friday before Eliminations on Saturday. For more info, go to www.MotivaSpeedway.com or call 505-400-0611. Click "Read More" to view or download Event Flyer. Santa Maria Speedway and Sand Outlaws Present the Pops Classic over Father’s Day Weekend June 14-15 at Santa Maria Speedway in Santa Maria, CA. Test and Tune followed by Racing takes place on both Saturday and Sunday during this event. For more info, go to www.RaceSantaMariaSpeedway.com. Click "Read More" to view Event Flyer. 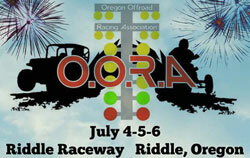 The Oregon Off-Road Association (OORA) is holding the Independence Day Shootout at Riddle Raceway in Riddle, OR on July 4-6. This yearly event starts off with Test and Tune as well as the Riddle Parade, Food, Fireworks, and more on Friday, July 4. Racing continues on through Saturday and Sunday. For more info, go to the OORA Facebook Page or call Gee Armstrong at 541-999-0173. Click "Read More" to view Event Flyer.